Public domain, vintage drawing of a letter H. This fancy letter image includes a shiny, carved letter H resting on the bank of a lily pond. With flowers, grasses and leaves surrounding it, the H almost appears as if it is hiding at the water’s edge. 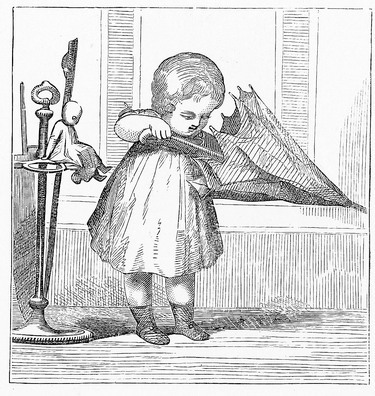 Use this interesting letter image in your next project to add that special something.A little girl struggles to get her umbrella open in this charming vintage image. With her dolly on her shoulder, the little girl uses both hands to try to open the umbrella and keep from getting wet from the rain. This copyright free image is part of a series of images depicting this little girl sneaking out into the rain and getting a bit more than she bargained for. Use alone or in combination with the 5 other pictures in this set. They are from the 1882 work Golden Rays which identified the engraver as Samuel E. Brown (d. circa 1860) but did not include author or illustrator information.